Whether you are interested in LLLT for hairloss or not, I think everyone trying to fight MPB would be well served reading this! This is the Golden Tamale... right? The $64,000 Question? ...or is it?! Isn't this what we've been told over and over that we must target to eradicate baldness? Devices as strong as our laser helmets and clinical laser devices grow hair and halt further hair loss... ALL ON THEIR OWN, without anything else. It's been PROVEN! Therefore, there *must* some mechanism by which LLLT reduces or removes DHT. I hear "OverMachoGrande... do you know the connection between lasers and DHT?" all the time. People in forums are simply waiting on the edge of their seat to hear how lasers fit right in to what they think they know about hair loss! Yes, I know the connection. If you want to read the answer, you'd better be prepared to "let go" something you may have been conditioned to believe as an absolute truth, though. I'm serious... don't keep reading unless you want to really learn something -and it's not what you expect! Ready for the answer? There is NO CONNECTION between lasers and DHT -ZIP, ZERO, NADA. 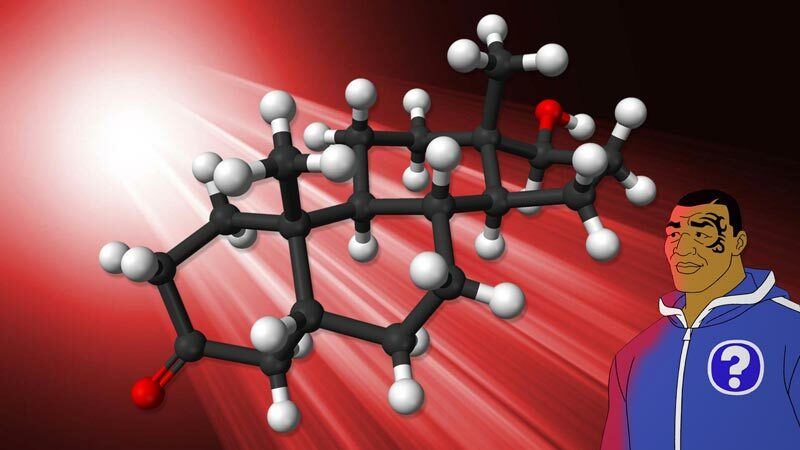 Out of decades of studies, there has been no bit of scientific evidence that shows lasers have anything to do with DHT, either directly or indirectly. The connection just plain isn't there! ...and this has been confirmed by TOP EXPERTS on LLLT! WAIT A SEC... then how is it able to grow hair and halt further hair loss?? Based on the current predominant theory of hair loss... this shouldn't be possible. A quick consensus of the "unlearned" members (I'm being very nice) of some forums out there will quickly tell you that! In fact, if you speak out that lasers can successfully combat hair loss without touching DHT, you'll soon, ummm... get the "pulse" of those members' feelings! Let's just say that a Frankenstein-style lynch mob equipped with torches et al wouldn't be that far fetched. http://​www.aventi​hair.com/​procedure/​index.php "Benefits of LLLT... Reduction of excess levels of skin 5-alpha reductase and dihydrotestoterone (DHT). These hormones contribute to the genetic thinning of hair." http://​search​warp.com/​swa242863.htm "(6) Reduces excess levels of skin 5 alpha reductase and DHT which contribute to genetic thinning." http://​www.style​infinity​htc​.com/ "How it works —Style Infinity™ HTC program works by stimulating the scalp, increasing the blood flow to the follicle where hair growth begins and blocking the harmful hair loss effects of DHT. The light of the laser is absorbed by cells, which causes stimulation of cell metabolism and improves blood flow, thus bringing life back to dormant hair follicles restoring lost hair." http://​www.querycat​.com/​faq/​931f0af070​1b4e73d32607​3eb3da2702 "How does low level laser therapy work? - This increase in blood flow is crucial to promoting a healthy hair follicle. The increase in blood flow brings the important nutrients into the follicle, while taking away harmful waste products such as DHT." http://​www.exclusive​image​hair​clinic.com/​how​.html "How it works... If you're looking for an alternative to drugs or surgery, this program works by stimulating the scalp, increasing blood flow, and blocking the harmful effects of DHT." These are pretty typical. Sometimes you'll even see a further explanation of how the stimulated tissue "shakes loose" the DHT clogging the receptors of the follicles. But seriously, folks... go ahead and crack out a rim shot -and JUST STOP IT. None of that is accurate! So, this is what is happening... some proponents of LLLT on the internet have -let's just say- "exaggerated" a little and have tried to simply "fit" the explanation of LLLT's success into the current predominant model of hair loss -the theory of DHT. 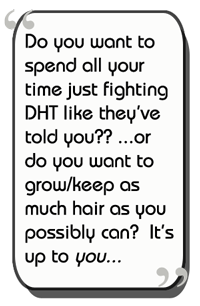 Most people who know anything about hair loss, especially people who know the mentality of hair loss forums out there, know that it's a "tough sell" to go against that theory... you WILL be attacked. 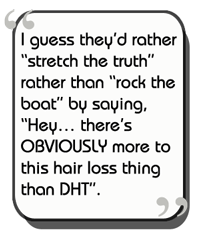 I guess they'd rather "stretch the truth" rather than "rock the boat" by saying, "Hey... there's OBVIOUSLY more to this hair loss thing than DHT". I emailed Dr. Maricle about this, and he said something I found to be very humorous: "Companies in this industry making up facts to suit the results? No way - not in hair loss. I call it sociopathic medicine. They believe whatever comes out of their collective mouths." lol... right on, Chuck! "Other Benefits Of Laser Therapy... Reduces excess levels of scalp dihydrotestorone (DHT) by aiding in the normalization of scalp sebum production." This is the deal: lasers make it so your hair shaft is smoother. A healthy follicle produces hair in which the cuticles -the shingles that makeup the outer layer of your hair- lay down more flat on the surface. Well, the "normalization" of sebum is that it can spread down the hair much more freely, making hair shinier and healthier looking. Normalizing production? No. Normalizing the spread down the shaft like it was intended? YES. Now, the meat and potatoes of this is the "faulty theory of DHT", and the even greater fault of people accepting it as gospel. I'm not going to go into much detail here because I could spend the rest of my forum days talking about it, but I will just say that OF COURSE the pharmaceutical companies and medical industry want to promote that DHT is the "be all, end all" culprit for hair loss... it's the one thing that they can PATENT! And for those of you that are thinking "Hey, O.M.G... NOBODY is saying that DHT is ALL of the puzzle, just a part! ", you obviously either haven't been a part of the forums for long or have forgotten what it was like. You should go back and see how Jacob was treated when he first started bringing this up way back in the early 2000's! One last point, yeah, yeah, yeah... I get the whole castration thing, but when you TAKE AWAY the things from the scalp that laser light can increase -S.O.D., N.O., the carrying of nutrients to the follicle, the creation of new blood vessels, eradication of itchiness and irritation, wound healing, etc.- you *also* lose your hair. There is much, much more to the puzzle than DHT blocking, and just because a company hasn't taken a product that works in another way through an FDA trial doesn't mean they aren't viable. So, in summary, laser therapy in the proper dosage can regrow hair and keep it -all by itself- yet it has no connection to DHT. Amazing! This post will have served a purpose if at least one person out there stopped and thought "Hmmm....".